It’s time to look at another beach-esque adventure. This one is at a local pool for most of it and there is a Pajama Party at the end, but it’s still fairly similar to the last two films. By now you know if you either like the genre or don’t. It certainly didn’t switch my mind as it is more of the same from the last film even down to the same premise. Throwing in the aliens was a decent move I guess, but I can’t say that it was a very interesting plot point so maybe it was just fluff in the end. The film revolves around an alien named Gogo. He is sent to Earth as an advance scout for Mars as they plan to take over the planet. They selected him to be the first scout because Gogo isn’t very smart and will confuse the Earthlings. Gogo is oblivious to this so his self esteem is surprisingly intact for the duration of the movie. The Earthlings decide to call him George since it’s a much more traditional name and he approves of this. Plans change though as he falls for Connie. Thing is, Connie is taken by Big Lunk, but wants to make him jealous so she decides to play along and pretend to be into Gogo. Meanwhile some corporate villains want to steal Big Lunk’s aunt’s treasure so they send in their special operative Helga to get the information out of him. Naturally she figures the best way to do this is to get together and Lunk has no problem two timing Connie. With this love rectangle can there even be a winner? Right off the bat you see the problems that are just inherent to the genre. For starters we have the constant rebounds between the characters that make you wonder how genuine any of them are. If they are willing to ditch their partners so quickly you can’t help but wonder if they will leave the new ones as soon as they see a better option. It’s hard to feel bad for any of the characters since this is the case. For example, Connie is frustrated that Lunk is always ignoring her so I suppose we are led to believe that this was not always the case. Nothing in the film suggests that he changed in any way though so it means that she didn’t mind his behavior at first and it is only now an issue. Meanwhile, you have to assume that maybe Lunk just never liked her all that much since he is very quick to get enthusiastic about Helga. The romance here is just all wrong. Naturally the film takes the low road and adds in a ton of fanservice now. We get poorly timed camera zoom ins and a lot of dancing that is more about damaging the film than proper form and poise. It’s nothing to be even remotely surprised about, but it hurts the film all the same. The villains’ plan to use romance to get to the heroes is always iffy at best as well and didn’t help their case either. It was interesting that we got 3 different villain groups though. Even for this series that is a little crazy. There was Eric Zipper and his gang, the Martians, and the people from Corporate. Naturally the corporate villains were the best ones as they brought in some fresh air to the series. The leader was actually pretty competent and always got a lot of good one liners in. He had a habit of beating up his 2nd in command quite a lot to show that he wasn’t to be trifled with. Unfortunately he is surrounded by incompetent henchmen so ultimately he was always doomed. Then there is the “Cowabunga” Indian who can’t speak too well. Naturally he doesn’t look very good and there is actually a big plot twist about him. He still looks better than the other henchmen though as that guy is the one who gets beat up a lot. I think his best scene was his debut appearance as the boss keeps talking to him about the plan and the henchmen manages to say the wrong thing each time and keeps getting punished. You’ll feel bad for the guy there since he was trying to be careful with his phrasing. Eric Zipperman and his gang are about the same as always so you’ll either like them or not. They get beat up a lot, but always have the coolest outfits in the film. These guys look like they play for keeps and surprisingly they actually knew how to fight pretty well this time. While they lost in the end that was mainly because GoGo stepped up and used his magic wand to stop them. Otherwise they were actually overpowering the teens at one point which I was not expecting. As for the Martians themselves, they didn’t have much of a plan for conquering Earth. I didn’t see much of an army at the base. Considering that the teleporter worked both ways, you’d suspect that we’d have seen soldiers on Mars when corporate went there. Instead the place was empty so I’m assuming that the army soldiers just deserted the Martian cause. Likely the right move to be honest since they probably wouldn’t have been able to defeat the teenagers if we’re being honest. This film definitely struck out and it’s unfortunate since for the most part it does have some reasonably humorous moments. It throws out so many jokes that some have to land after all right? I do like that Big Lunk was fine with the friend zone for a while, but it’s too bad that he relented in the end. If you cut out all of the pool shenanigans, romance, and fanservice then this is a quality film. The problem is that we’re talking about a totally different movie at that point. The film has to live or die by the mistakes it made and unfortunately this one just couldn’t cut the mustard. 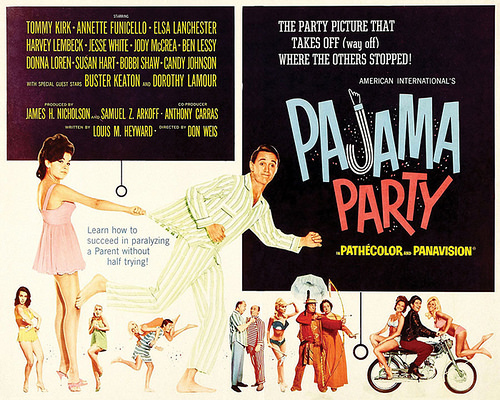 Overall, Pajama Party is one of those films that won’t be remembered all that well. It will just fade into place next to the other Beach movies where the heroine tries to get the hero jealous. Of course in this film the plan didn’t even remotely work and she actually just gave in to the rebound. That’s a bit of a twist compared to the other films, but it’s not exactly one that would help the score of the film. It was doomed fairly early on anyway so I guess it’s not like the film had much of a chance. They just need to do something a little more classy like a sweater party movie. I’m sure the film would find some way to mess that up though. If you want a good party movie then I suggest you look elsewhere. This entry was posted in Live Action Movie Reviews, Live Action Movies, Reviews and tagged Beach Party, Comedy, Film Review, Movie Review, Pajama Party, Pool Party, Review, Romance, Sci-Fi by dreager1. Bookmark the permalink.